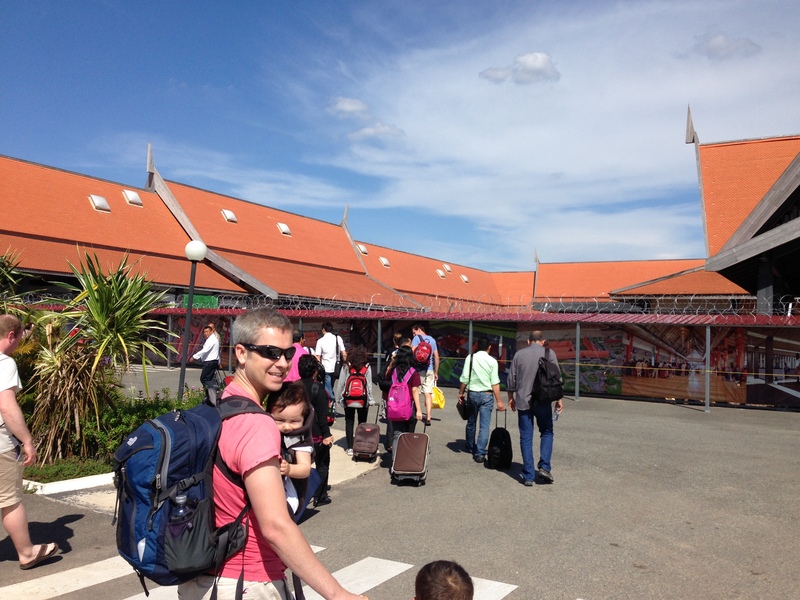 Siem Reap was one of the highlights during our trip. We followed the lightweight guide to Angkor shared by Never Ending Voyage. Their post “A Lightweight’s Guide to the Temples of Angkor” was invaluable. 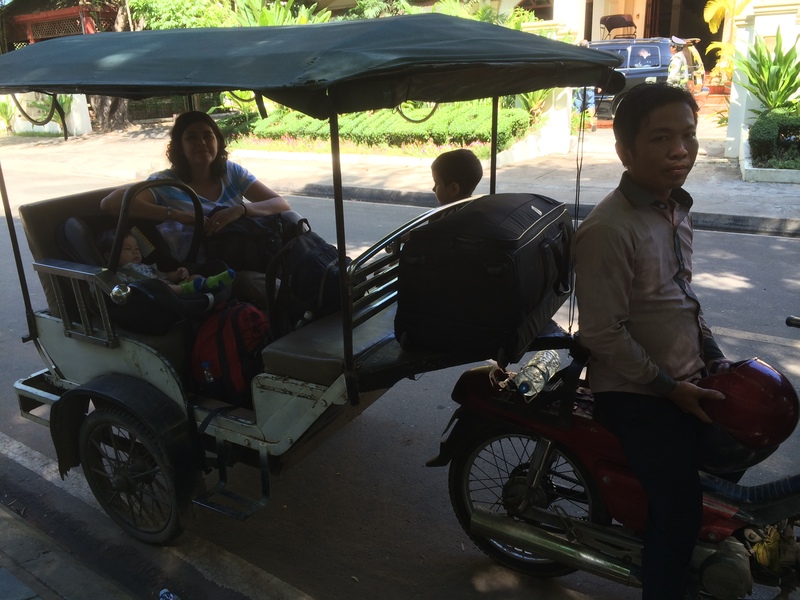 It is a must read and we followed most of it, however, whilst travelling to Siem Reap with kids you soon learn a few extra things worth sharing and that is the focus of my post. People will argue about rainy season vs dry season. Some months are hotter than others. You will be advised that taking a baby when it is so hot is not a good idea, impossible, etc. In my view we went at the perfect time; beginning of June. It was low season, very affordable, “quieter” and only had two occasions of rain which were much appreciated. It’s all about the visa. A well organized process that takes around 30 min to an hour. Take your own passport pictures with you and the amount to pay in USD. If you don’t have the cash there is an ATM that dispenses US notes. You do not need to take pictures for the children (Dylan was 4 at the time) but you do need to pay for their visas and fill in all the forms even if they are infants. We learned this the hard way and it took us almost an hour to get through. Need a local sim card for Cambodia? After bag collection there are a few cubicles before you exit the airport that sell these along with data plans. The terrain and steps do not accommodate strollers so a baby carrier will be your best friend. We hired our own tuk-tuk as opposed to the organised tours. Our driver would take us everywhere and anywhere we wanted, day or night, rain or shine. We took a leap of faith with our driver who we met off the street. He was well presented and had a nice smile. Whilst his English is intermediate he would give advice if he felt we were doing something wrong or we were planning to go late somewhere. His name is Mab and this is his phone number is +85 517 553 379. Probably best to have the hotel give him a call for you. Very trustworthy and when it came to paying he just asked us to give him what we thought was fair. The only occasion we used a private car was to visit Banteay Srei. We booked a car via Long Kim San. Our driver happened to be a former monk. His English was excellent and he had children the same age as ours so gave us great tips. He also drives a tuk-tuk. A big advantage of the car was the A/C! There are so many restaurants in town and it can be overwhelming as they all look good. The centre is buzzing and seems to have a great nightlife. We were all very tired after exploring the temples so sitting in a restaurant seemed like a task each night. As the hotel had a kitchen we bought food based on Tripadvisor reviews and would just bring the food back to the room and have a peaceful meal at the dining table while the children were asleep. We also found many imported products, even more so than in Thailand, so took advantage and bought some Heinz baked beans for Dylan. 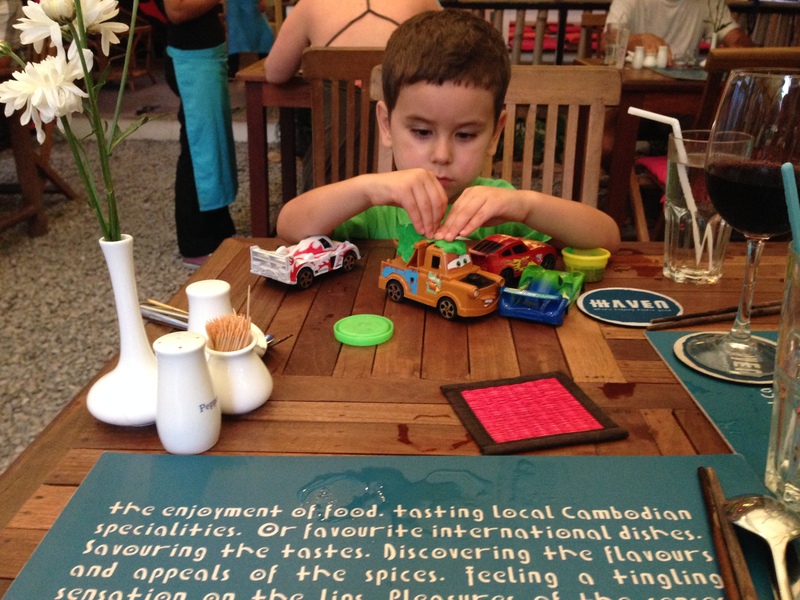 The one restaurant I will recommend is Haven, a training restaurant for vulnerable young adults from orphanages. Excellent service. They were lovely and patient with the children, food was absolutely delicious, and it supports a great cause. No doubt why it is at the top of Tripadvisor. Read all about it here. Booking is essential and we managed to take the last table they had for a 6pm sitting. 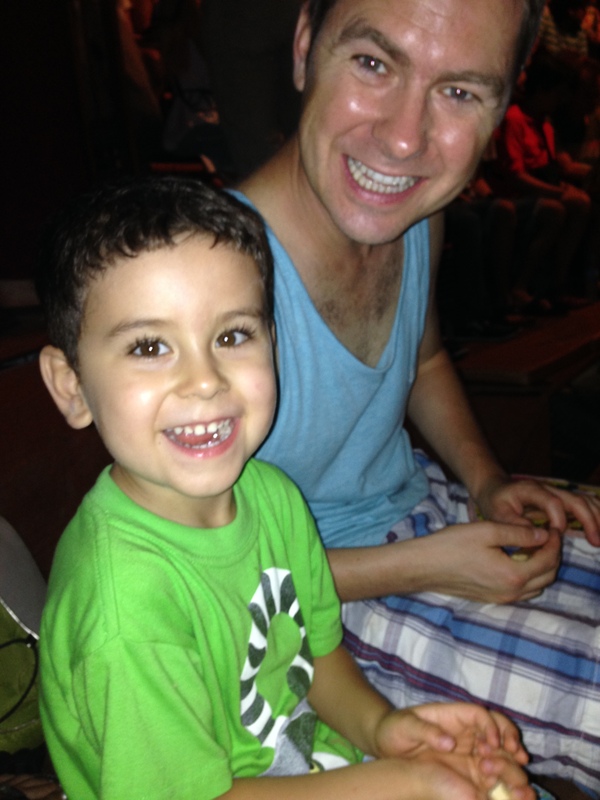 We decided to go the Phare Circus to support their worthy cause. The show starts at 8pm so Dylan was not so tired. There were other families with small children. Some loved it though others were afraid of the fire – depends on your child. Dylan loves fire and acrobatics so he really enjoyed it. Jonas on the other hand fell asleep before it started and woke up once, had a glance and went back to sleep. Returning from Banteay Srei temple our driver suggested a quick stop at the Cambodian Landmine Museum. The founder of the museum is such an admirable person and you will read harrowing tales about the Khmer Rouge. A humbling lesson on Cambodian history. This is a must. By day 3 we realized Dylan was “templed out” and needed a break. We went to Jungle Junction, owned by a Kiwi family. It has large grounds with trampolines, bouncy castles, outside seating area, swings, indoors play area with ball pool. They have it all and what is best is that they will look after your baby/child while you enjoy a drink on the top floor. Free babysitting – thank you! We even indulged on a game of pool and had cocktails and food. We got their by tuk-tuk but not many drivers knew where to go. Feels it’s a bit out-of-town but only 5 minute drive. Really worth it. Just arrange your transport and make sure they know where they are going. Check our top temples here soon as it deserves a post on its own right. Can’t wait to read about the temples as I’ve been dreaming about seeing those all my life.